First, in order to claim that adoption tax credit next year on your taxes, your adoption must be finalized this year, before December 31st. If you have not gone to court before a judge in a final adoption hearing, then chances are you have not finalized your adoption. If a child has simply been placed in your home as a foster child, that is not adoption nor is it guardianship. Consult with your caseworker or attorney and make sure the adoption has been finalized. Secondly, make sure you have in your possession the final adoption documents, such as the order of adoption, with the judge’s signature. This has a lot of important information such as your name, the child’s birth name, etc. Keep these documents in a safe place. Third, determine what adoption expenses you have used for this adoption including the following: adoption fees, attorney fees, travel expenses, court costs, and any other fees associated with the cost of adopting a child or children. If you completed a foster care adoption, and your expenses are zero, you may still be eligible for the adoption tax credit if the child has special needs. International adoptions are not considered special needs adoptions; however, there are major costs involved. So, either way, you should be covered. Consult your tax advisor or visit this website for more information. IRS Form 8839 is an attachment to your IRS form 1040. There are other factors that this form will help you determine such as income requirements, the years and amounts you are claiming expenses, the age of the child, etc. Consult your tax advisor for more details. Visit this website for more information. An “adoption subsidy” is a grant distributed monthly from your city, county, or state that is provided to a child with special needs which may include any type of physical, mental, or developmental disability or emotional disturbance. Some states allow for a monthly subsidy for children that might not otherwise be adopted without it. For example, Arizona allows an adoption subsidy for a child with special needs up until the child’s 18th birthday or 21st birthday if he or she is still in school. Adoptive parents may be able to claim a child as a dependent on their taxes if 1) they have had State custody of a that child; 2) they have resided in their home for six months or more the previous year; 3) they are 18 years or less and 4) if no one else claims the child. You will need these things: the child’s full name, date of birth, and a valid Social Security number. Consult your tax advisor. Visit this website for more information. Does your job provide adoption benefits? Above and beyond the Family and Medical Leave Act (FMLA), which already allows unpaid leave for the adoption of a child, your employer may offer retirement benefits, paid leave, child care, and financial reimbursement. Check with your Human Resource Department for more details. Do you not need the adoption tax credit? Great! Claim it anyway, then put it into an interest-bearing savings account or 539 College Savings Plan for the child’s later use. 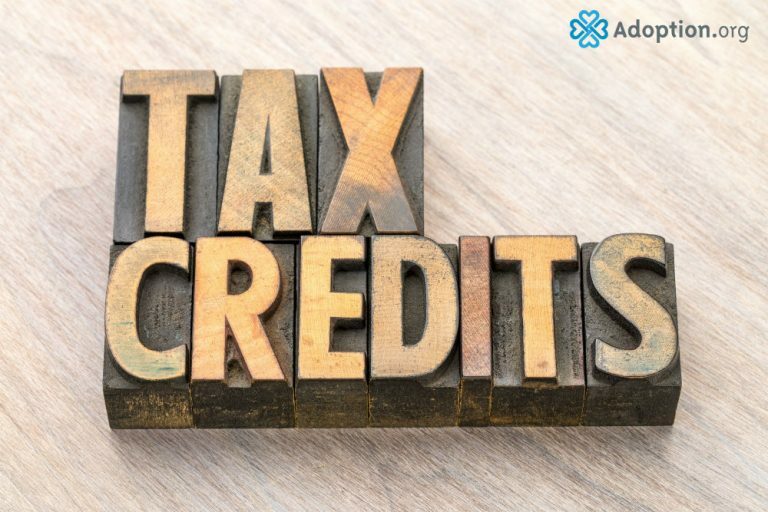 Many adoptive parents have used the tax credit for great things such as adding an additional vehicle, putting an addition on a home, or going to Disneyland! As with everything concerning legal or financial issues, every situation is different. Ask your case manager, attorney, or tax professional in your situation if you are eligible. No one is getting rich off an adoption tax credit, and it should be used for the child’s benefit. But, adoption should be a blessing to all!